UPDATE: So maybe the manatees, didn't do so great in the Craftster challenge. But Beefranck liked them enough to feature them on Stitchgasm on Mr. X Stitch. I just finished this embroidery sampler today and will soon be entering it into the next Craftster challenge: Inspired by Nature. Perhaps you have not yet been warned about the sinister MANATEE AGENDA? I started creating the idea for this piece after reading this mofo-ing hilarious article: Tea Party Hates Manatees. See how I even used that same picture as inspiration? Aww, Manatees. Who would have guessed that such adorable creatures could be so evil? Pssst, kid. Interested in some environmental literature? Remember the good ol' days when you could go to your local store and buy laudanum? Not to worry. The understudy -- Pink Balloon Head was ready to replace Creepy Doll in the role of naive ingenue. She had her lines completely memorized. Here are excerpts from my pulitzer-hopeful play. *Pink Balloon Head stares thoughtfully into the middle distance. Evil Crochet Flower: If I prick you do you not pop?! but cute hat, right? I will be selling them! I didn't use a sewing machine though. These are completely hand-stitched. I feel rather ambivalent about sewing machines. Maybe from all those years of taking sewing lessons and being a complete failure at it. 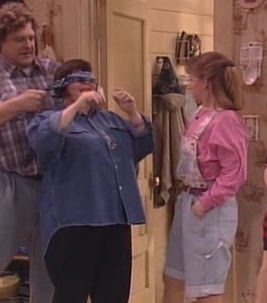 When I was fifteen, I followed a pattern for shortalls faithfully. Oh, what are shortalls? The belt adds a nice touch! The ones I finished were pretty cute, but I couldn't figure out why the front was so much longer than the back. Yeeaaah, I must not have looked closely enough at the pattern, because the shortalls were maternity shortalls. Oops. Did I mention that I was fifteen years old? (Mom, I have something to tell you . . . .) I think that this is proof for the tea-party folks that domesticity leads to sin. Back to the sleep masks! For sale only at Craft Lake City! 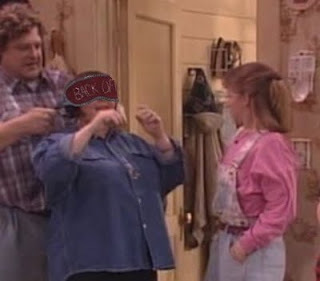 Roseanne was so ahead of her time. Mr. Floozy is out of town so I turned to twitter and facebook for suggestions for short movie quotes. I stitched the first three short quotes quickly and then I went to an old-folks buffet with my kids. After that, shoe-shopping. I also tapped on the window of a couple of teenagers making-out in their car. It was fun! I really wanted to stop and give the boy some tips, since his head was rotating on his neck like a hypersonic ferris wheel. But I didn't! Can you guess the quotes? You know what I hate? Breast Cancer. I realize that this sets me apart from everyone else. That is why I am a huge trend-setter with this idea I had of making everyone aware of breast cancer with the aid of wearing pink ribbons. Totally a revolutionary idea! If you come to Craft Lake City (which you will, because you love me) you can have a Floozy Pink Ribbon. For free! Okay, not for free exactly, but with the purchase of anything from my booth. What's with the sudden interest in breast cancer awareness? Well, my mom has it. And I freakishly adore her. And something about this cancer pisses (sorry about the near-swear, Mom) me off. Pin me on your boobie, moobie, or prosthetic such. I have a cute pin! Creepy Doll also hates breast cancer. The color pink brings out the creepiness of my eyes. Okay! Maybe you want to stop reading this post here.